This last decade has marked the darkest period in Japan basketball history, with the sport divided between two rival men’s leagues. What’s more, the Japan Basketball Association was suspended by FIBA, the sport’s world governing body, for its lack of governance, between December 2014 and August 2015. But now the B. 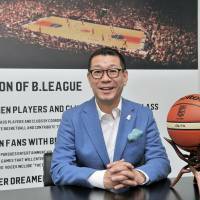 League, a newly formed league essentially created by combining the two leagues during the JBA’s ban, will try to begin a completely new era for Japanese basketball with a new approach to try to gain major-sport status in the country. Speaking in a recent exclusive interview with The Japan Times in his Tokyo office, the B. League’s inaugural chairman, Masaaki Okawa, said that he was pleased that his league’s first-ever season will get under way with a contest between the Alvark Tokyo and Ryukyu Golden Kings at Yoyogi National Gymnasium on Thursday. The opening game has been widely advertised in the media and will be televised in prime time on Fuji TV’s network channel. Okawa, however, can’t just sit back in his chair and celebrate the launch of the league. In fact, he said that he would never breathe a sigh of relief for as long as he retains his position as the league’s chief. He feels pressure to satisfy the sponsors, such as SoftBank Group Corp., which is estimated to have invested over ¥12 billion to acquire the broadcasting rights for its live-stream service on Sportsnavi Live for the next four years. National broadcaster NHK has also obtained TV rights. Okawa had previously worked under Saburo Kawabuchi, who served as co-chairman of the FIBA-anointed task force during the JBA suspension, at the Japan Football Association and J. League as executives. He was asked by J. League founder Kawabuchi to become the chairman of the B. League, which consists of 18 first-division and 18 second-division clubs. 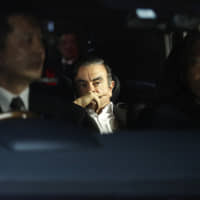 A former employee for Mitsubishi Bank, which later became Bank of Tokyo-Mitsubishi UFJ, Okawa is a business-minded person, but said that he wouldn’t have accepted Kawabuchi’s offer if it been any other sport. 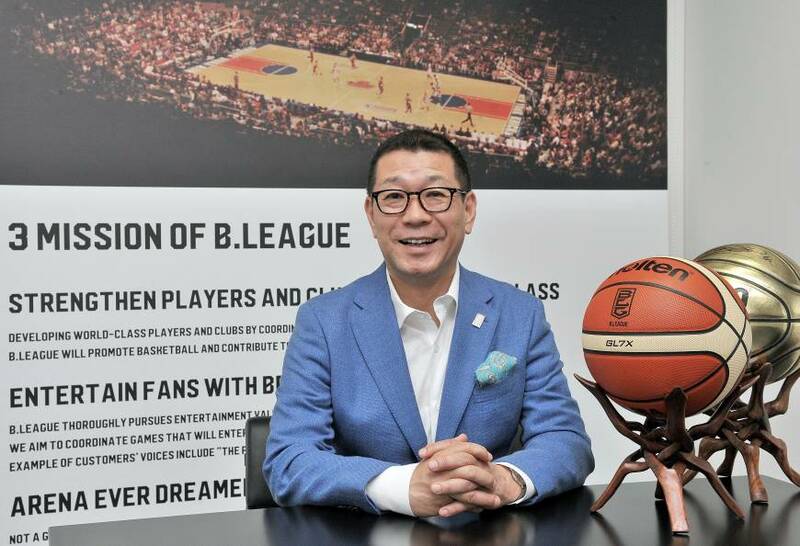 Okawa, who is also a co-vice president of the JBA, said that he’s always hoped to turn Japanese sports into bigger industries, whether it’s basketball or soccer. The JBA and B. League have also established a marketing company, called B. Marketing, to consolidate sponsorships for the two entities, maximize their values and enlarge the marketing size of Japanese basketball. But with all the investments by sponsors and broadcast deals, the potential of the league as a professional sport and its success are uncertain at this point — the sluggish performances by the men’s national team has also been a factor. Can the smaller-budget professional clubs really compete on a par with wealthier ex-corporate teams that have better players? Will the former corporate clubs, such as Alvark (Toyota Motors), Brave Thunders Kawasaki (Toshiba) and Sunrockers Shibuya (Hitachi), make a serious effort to attract paying fans to their arenas? Okawa said that each club has its own strengths and issues both on and off the court and it’s hard to summarize that for each club. But as far as the level of competition and the business scale between the former corporate teams and professional clubs in the B. League, he isn’t worried too much because he believes the teams will try to overcome their present problems and improve their situation on their own. Some think that the former corporate teams, with their superior Japanese players and imports, will have an advantage in the early years. 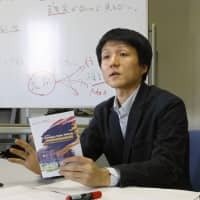 But Okawa doesn’t necessarily think that way, citing some non-corporate teams that have steadily racked up revenue and used it to acquire higher-quality players like the Tochigi Brex and Chiba Jets have done while competing with the corporate clubs in the NBL. 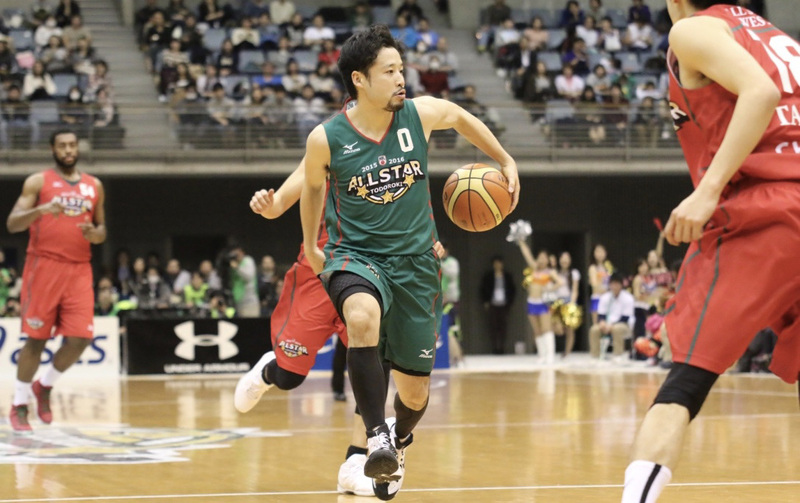 “You could presume that the (former) corporate teams of the NBL will be relatively superior and there’s a bigger chance for that to happen,” said Okawa, a Kyoto Prefecture native. “But after a few years, I think that there will be cases like Tochigi and Chiba, and I don’t think it will take five-to-10 years to see that happen. Asked whether the former corporate clubs would put in more effort to become legitimate professional teams in the B. League, Okawa also expressed his confidence by saying that those clubs have recruited expert staff from other professional teams to work in public relations, ticket sales and community activities and they would help foster a more professional mind-set. Okawa added that after Japanese soccer turned pro with the start of the J. League in 1993, clubs that had previously been corporate clubs were eventually recognized as genuine professional clubs. Another key element that the league is advocating is to turn the old-fashioned gymnasiums into attractive, ﻿﻿ entertaining arenas so the fans will want to return. Okawa insisted that having arenas like pro teams use is as important as the players, staff and club management becoming professional. “When your arena is great, it makes it more fun for the fans,” he said. Because people like Kawabuchi and Okawa have been involved in the league’s creation, the J. League has been mentioned many times in regard to the B. League. The league is actually modeled after some of things that were put into practice in the soccer circuit. One of them is the club license system, which the basketball league will introduce from the 2017-18 season. The first- and second-division teams will need to have B1 and B2 licenses, respectively, to play. The license criteria state that the first-division clubs will need to have a 5,000-seat arena (3,000 for the second-division teams) and revenue of at least ¥100 million annually, while they are not allowed to have a financial deficit for three straight seasons, among others. If they don’t meet the criteria, they will be stripped of their license. Okawa regards the license system as something that provides stability for the clubs and the entire league. He added that the J. League no longer has teams on the brink of collapse thanks to the effectiveness of the system. He added that occasionally sports clubs only give rough estimates with their finances, and the license system is intended to avoid that. The league will share its revenue with the clubs as well. 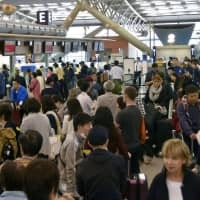 The average distribution amount is estimated at between ¥40 million and ¥50 million but, in an interesting twist, it will vary depending on a team’s attendance figures and also the number of followers and “likes” it has on social network services, including Facebook. The league estimates that it will earn revenue of ¥5 billion for the first season, and Okawa said that the league “would shoot for doubling the figure” following the 2020 Tokyo Olympics. Meanwhile, the B. League is looking to make a big impact in its inaugural campaign, including the aforementioned Alvark-Golden Kings opener, to advertise the new circuit to the public as the J. League did 23 years ago. But what’s different for the B. League is the absence of globally famous players such as the J. League had, in the shape of Zico, Gary Lineker and Pierre Littbarski. Okawa said that times have changed, and the J. League had been able to acquire some of those world-renowned figures before broadcasting fees skyrocketed in Europe. 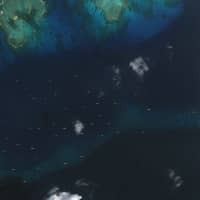 “The J. League was lucky,” Okawa said. Okawa added that it’s not an issue just for basketball but for Japanese sports in general, because Japanese sports leagues are no match for the world’s major leagues in terms of their business scale. “Unless they have success in making their business bigger, better players flow out overseas and it gets harder to get (better) foreign players,” he said. Professional basketball is a star-driven sport and the B. League will have to have more household names among Japanese players as well moving forward. 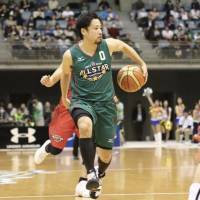 Currently, former NBA guard Yuta Tabuse, who has played for the Brex since 2008, is pretty much the only player that most Japanese recognize. Okawa said that the league proactively needs to install a system to develop players from youth into stars, while the league and clubs will need to commit to promote top players. The B. League received three spots for the NBA Development League tryout last month. Okawa hopes to increase that number to about five next year. The league is attempting so many new things that other basketball administrators in Japan hadn’t done in order to transform it another major pro sports circuit, following baseball and soccer. For that to come to fruition, Okawa is keeping himself busy. “If I have too much free time, that would be embarrassing,” Okawa smiled.